Did you see Green Team featured in the Eagle Tribune? "Teen farmers from Lawrence help grow fresh vegetables to feed to poor"
All concerts are at the Farmers Market from 1-2 pm. The Live Lawrence! Traveling Cafe Series schedule will be available soon! We're busy as ever this time of year here in Lawrence, and we hope you and yours are well and enjoying all that summer in New England has to offer. This year Groundwork Lawrence's summer programming focuses on increasing availability and consumption of fresh, locally-grown fruits and vegetables right in the heart of our city: our Green Team is learning about growing food, eating right, and moving more; the community garden beds are bursting with life; our second CSA season has 150 shareholders; and our Farmers Market kicked off the first week of July. We are pleased to report that Edible Boston's Summer 2008 issue highlights us and our fresh food programming - look for copies at the market, at CSA pickup and throughout the Greater Boston area. For regular updates on our events, program activities, and recent media coverage, please visit us at www.groundworklawrence.org. Thanks for reading! Our Green Team has hit the ground running this summer. The Green Team can be found tending their community garden plots at Scarito Park, maintaining the Leonard School garden, weeding and harvesting at Johnson Farm in Windham, NH for local food pantry Neighbors in Need, helping on Tuesdays to unload the farm truck for our Community Supported Agriculture program, and assisting as managers of the farmers market on Wednesdays. As emerging leaders in our community, Green Team members are engaging as stewards of our city's built environment by conducting park and alleyway clean-ups, and documenting pedestrian safety issues with a series of walking audits. Green Team is also learning the benefits of saving for their future with regular financial literacy workshops. Finally, Green Team will spend some time this summer visiting new places and meeting other youth leaders engaged in similar work through field trips with other Groundwork Trusts in New England and UTEC in Lowell, visits to National Park Sites in the region, camping on Cape Cod, and outdoor community service with Trout Unlimited. We're excited about the great start to the second season of our Community Supported Agriculture (CSA) program with Farmer Dave of Brox Farm. Last year we had 60 CSA members subscribe, and this year we are excited to have over 150 members join us! Pickup began Tuesday, July 1st and will continue through Tuesday, October 28th. Thanks to our members and Farmer Dave, as well as our new Volunteer Distribution Managers Debra Scannell and Iris Marte. Don't forget that flower shares start on July 22nd, and fruit shares start on August 12th. Please call the Groundwork Lawrence office if you'd like to be added to next year's CSA waiting list. Check out pictures from the first CSA delivery here! Farmers Market and Live Lawrence! The Farmers Market began Wednesday, July 2nd at Appleton Way (next to City Hall between Essex and Common Streets) in downtown Lawrence. Fresh Massachusetts-grown vegetables, fruits, breads and plants are available, and for your convenience we continue to accept payments with WIC coupons, Food Stamps/EBT, and credit cards. The market features extended hours this season-- from 10:30am - 6:30pm-- to provide greater access to the market for working people in Lawrence and commuters returning home in the evening. 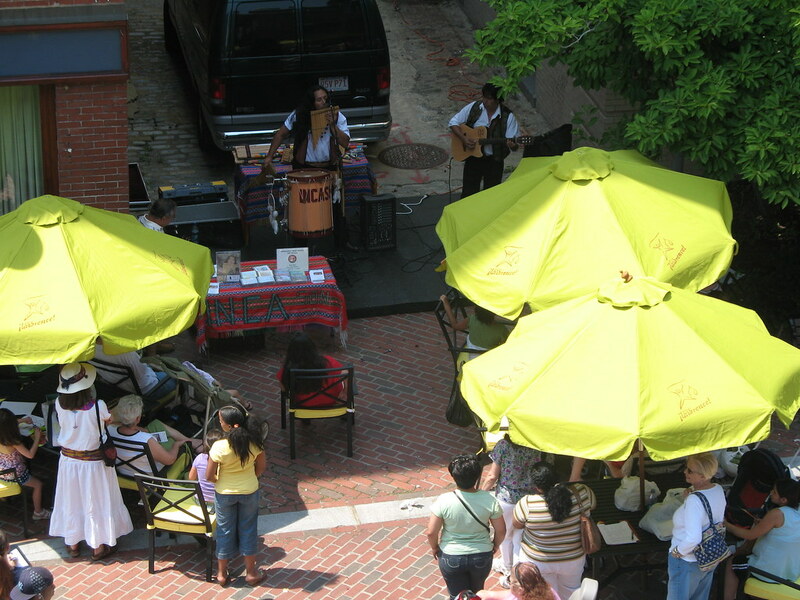 Please also join us for our Free Summer Concert Series running from 1-2pm in July and August during the Farmers Market. We kicked off the LIve Lawrence! 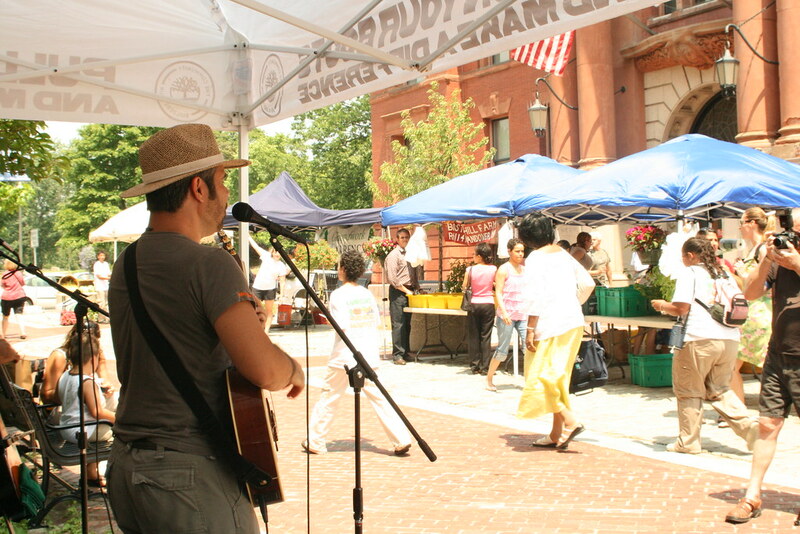 Summer Concert Series on Wednesday, July 9th with Los Sugar Kings; Massachusetts State Senator Susan Tucker was on hand to purchase some fresh veggies, and to officially kick off the 2008 market season. Cooking demonstrations by Chris Young of Mill City Gourmet and UMass Nutrition Extension showcased fresh vegetables for sale at the Farmers Market, and the Green Team painted faces for local youth. Check out pictures of the day on our Flickr page! 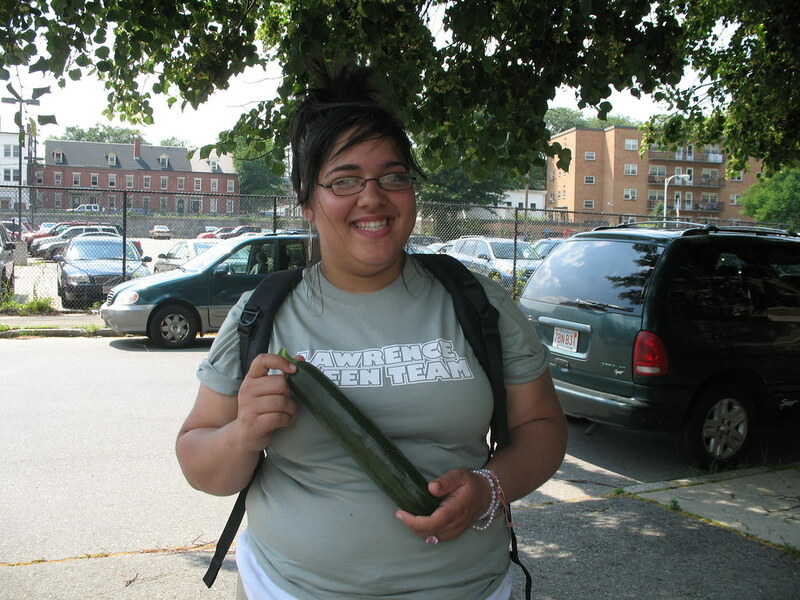 We'd like to say good-bye and best wishes to Heidi Stucker, who completed her year of service at Groundwork Lawrence through the Americorps*VISTA Program as our "Fresh Food Intern" on July 2nd. 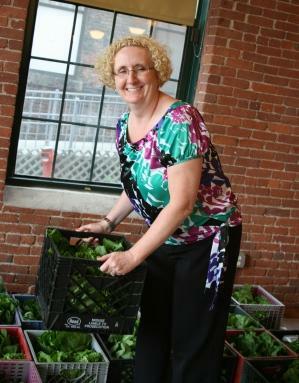 You may know Heidi from our CSA, our Farmers Market and our community food research project, which was funded by the USDA. We wish her all the best, though she's still close by and working for Farmer Dave as manager his other CSA drop-off sites. We also have some new faces in the office! Laura Denison started with us at the end of April as our Education Intern. She has been working with our Green Team and will conclude her Americorps*VISTA service in November of this year. Julia Littlefield is our summer intern for 8 weeks, and has already been a huge asset to the office. Julia's internship is made possible by collaboration with the Forest Foundation, and we'll certainly miss her when she heads back for her second year at Bowdoin College in the fall. Rowan Van Ness will be starting at Groundwork Lawrence as our new Americorps*VISTA on July 21st-- please be sure to say hello to her at the Farmers Market! Finally, Janel Wright started coordinating the Live Lawrence! art and cultural economic development program with Karen Wood in July. You can meet them both at the Traveling Cafes and at the Farmers Market Summer Concert Series. 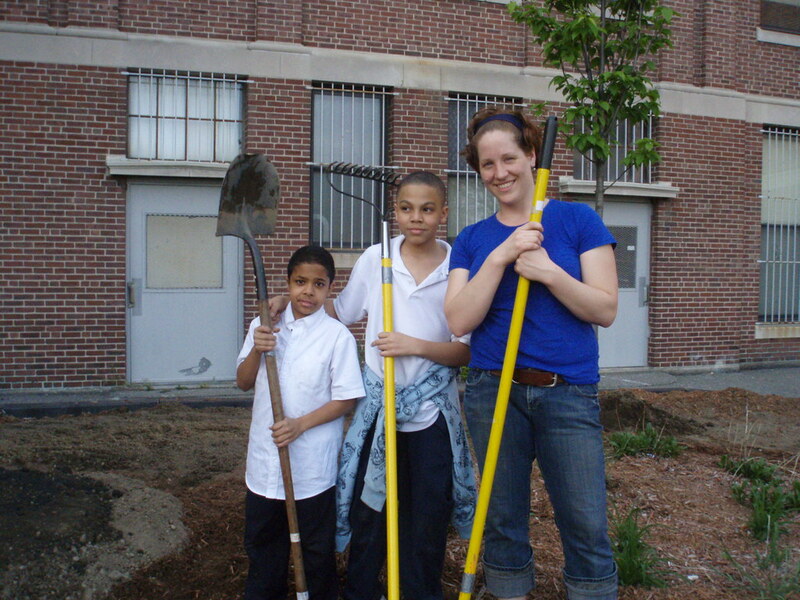 For more information on how to support Groundwork Lawrence and its projects and programs, please visit us online. Hope to see you on Wednesdays at the Farmers Market, and of course at our 7th Annual Spicket River Cleanup on Saturday, September 13th!